WoW @Bryan1986 u got more toons than most people who play this. Dang I could use a FOTP! He's a massive dps but such a slow grind. U can have multiple teams. Say u make one team first order, then another team Jedi because your huge collection allows u multiple pathways. 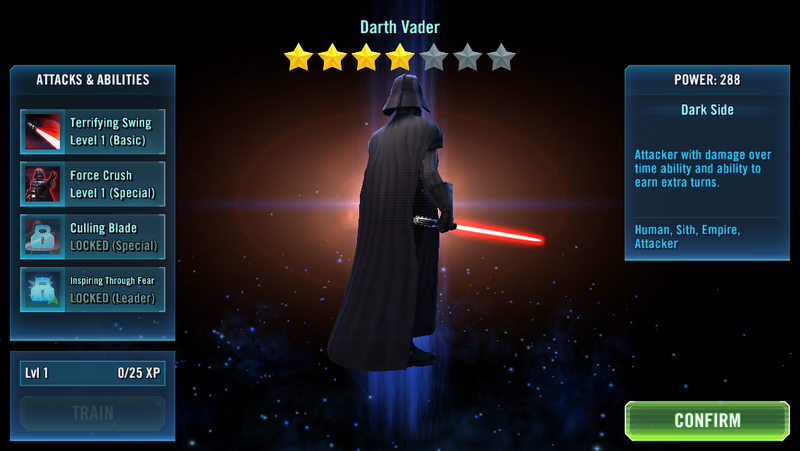 Even your HK is higher starred than mine lol. And u have a maxed 86. 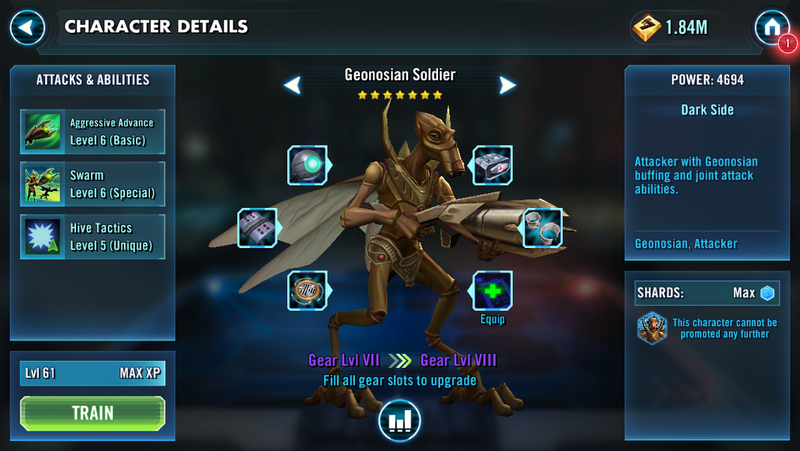 As u already have those three u can just add GS and a taunt such as Poe or Han to make a droid team. 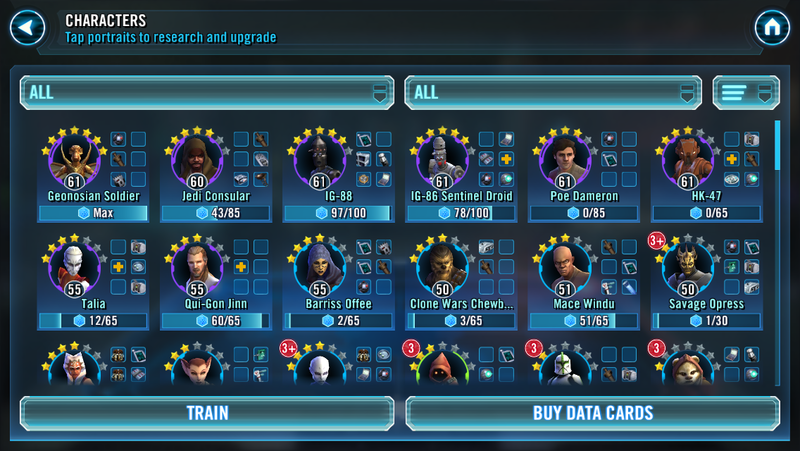 There are so many options and u could use all different teams for GW. Lol I was writing a reply to your post about 20000 in a server then I saw the quote change to edit. Yes that's right there is no 'pause' in the game. 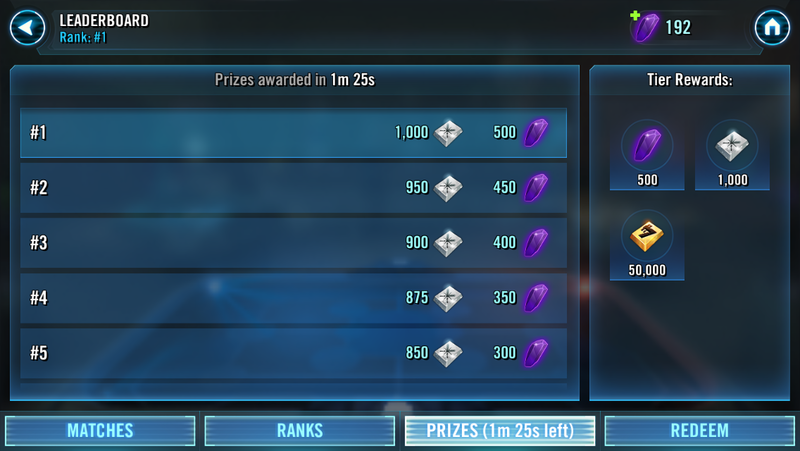 If someone just abandon the game and come back a month later the top ranks would already be level 70 and that person would still be the level left before the departure. Would be better just creating a new account like I did. As u can read it only took like 20 days to reach level 60 and top ranks. Not hard at all. And yes it's now six pages long! It does take a while to load as it's images heavy but a picture is worth a thousand words! I like it, keep up the Diary entries! I just came to the thread late so I didn't realize it was already 6 pages long. Glad to know you like my adventures! It started sort of a blog thingie which came as an idea and now many people read as it does help newer players as well and it's fun to see the progress of others. Hi Guys, been a busy couple of days so have not been able to respond or keep up with the blog updates. Far out @Bryan1986, you have had some of the best pulls I have ever read! So jealous!! Sounds like your team is pretty rock solid @Reyia, especially from what Bryan is saying. 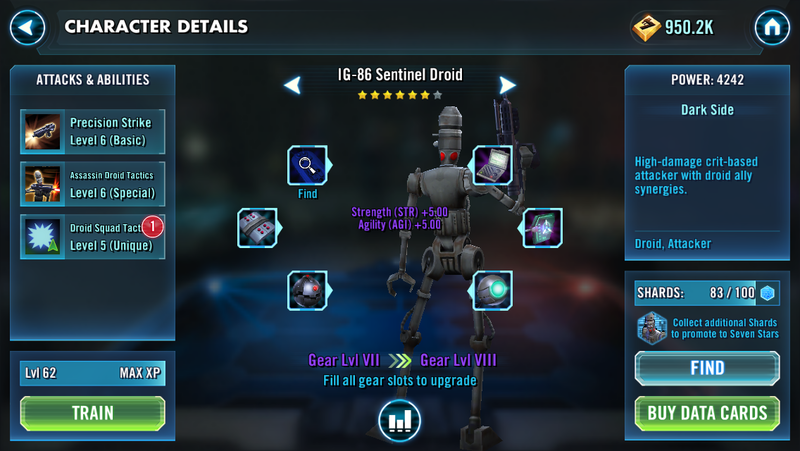 Makes me regret not buying that droid pack, definitely one of the better value for money packs out there. 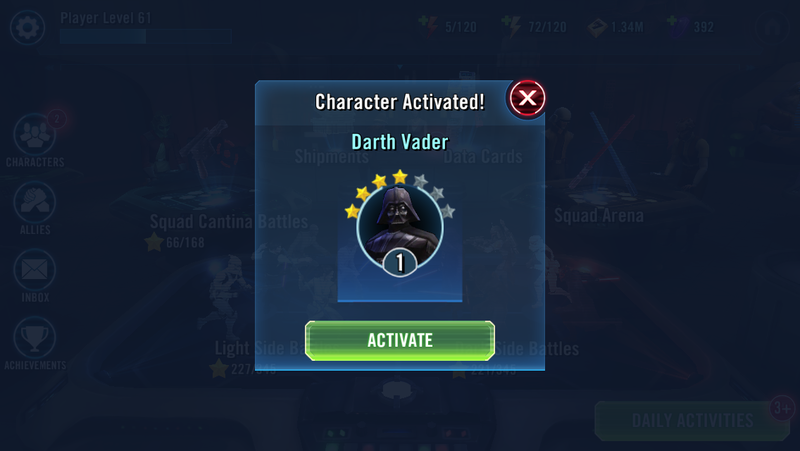 Ah well, I have only bought the dark side starter pack for this account so keen to keep it ftp and see how far I can go and how well I can keep up. I have been able to get to 4th the past two days without forking out for refreshes so pretty proud of that. 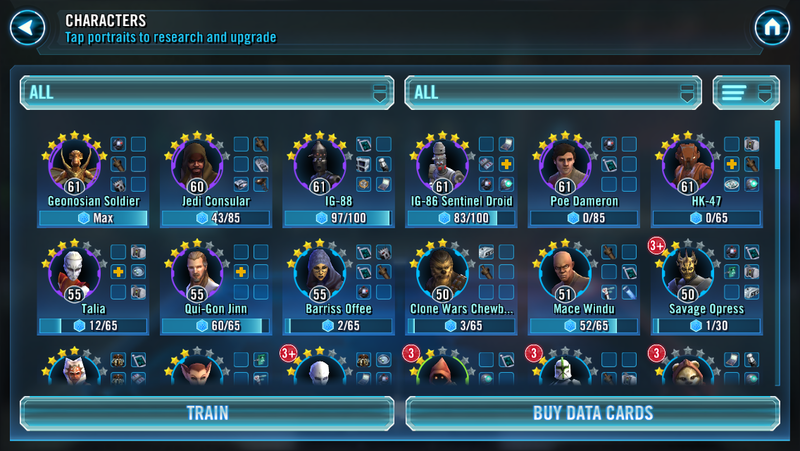 I was going for a first order team long term, have heard pretty good things about Phasma, FOO, FOTP, Kylo and various 5th toons. 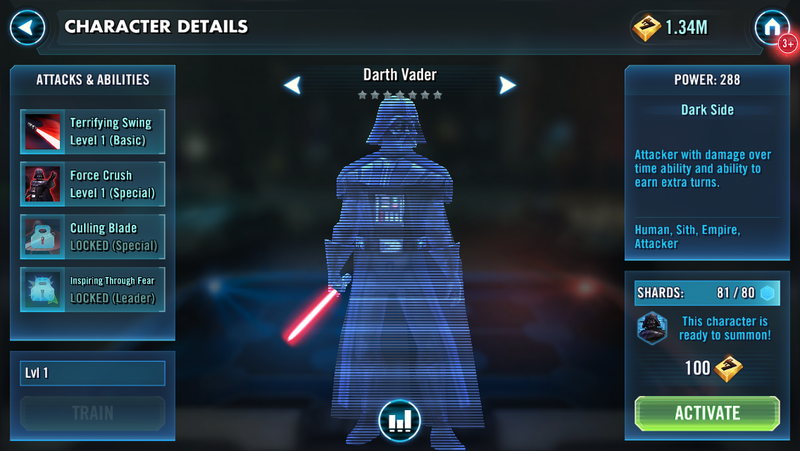 Was considering swapping out Sid for Kylo for extra HP still with chance for healing block. 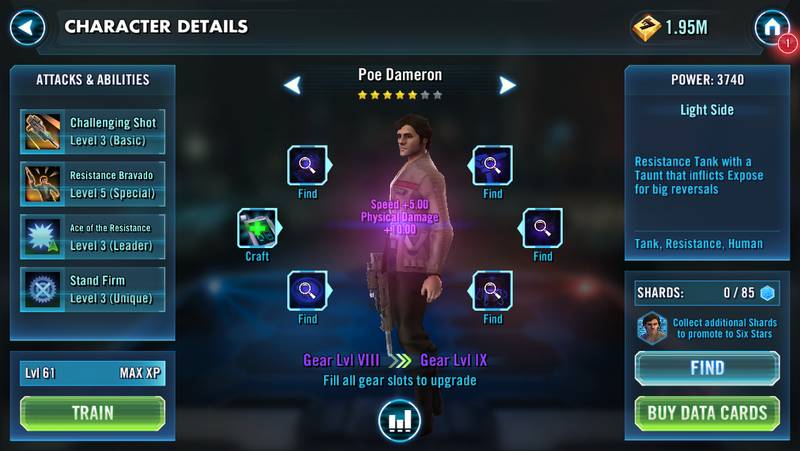 Medium term I was aiming for Phasma, Kylo, QGJ, Poe and GS but you guys have given me pause to think. 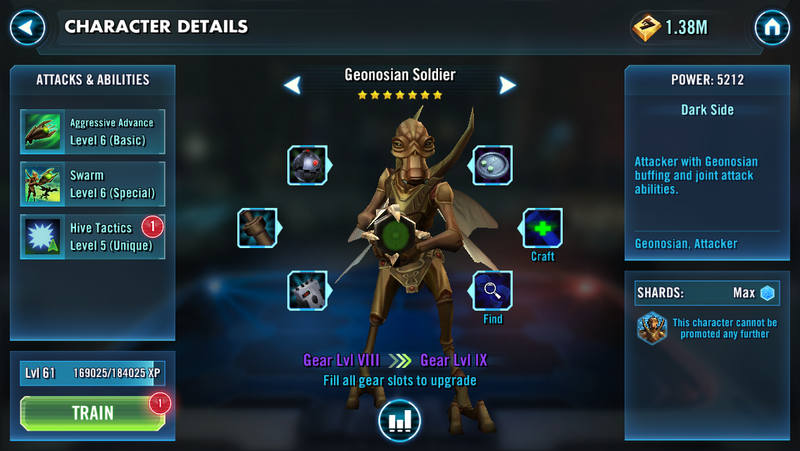 I am still a way off 7* GS so have some time before making a decision. Yea @Giodude2000 I tend to keep my rank nowadays with my team! 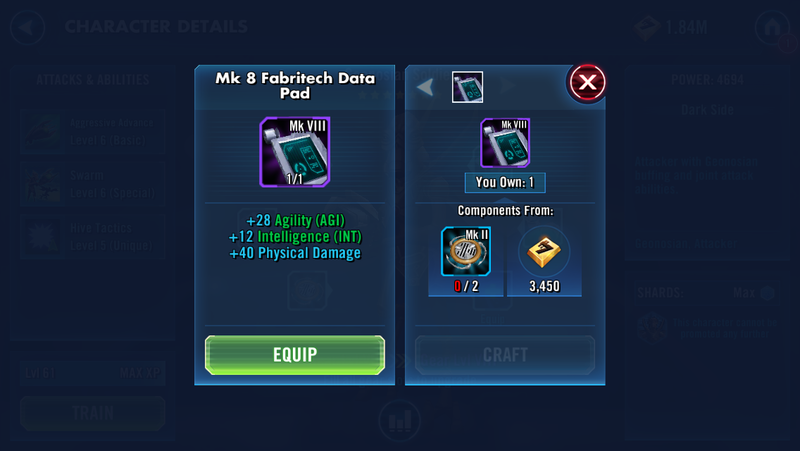 The droid pack is one of the best pack u could buy. 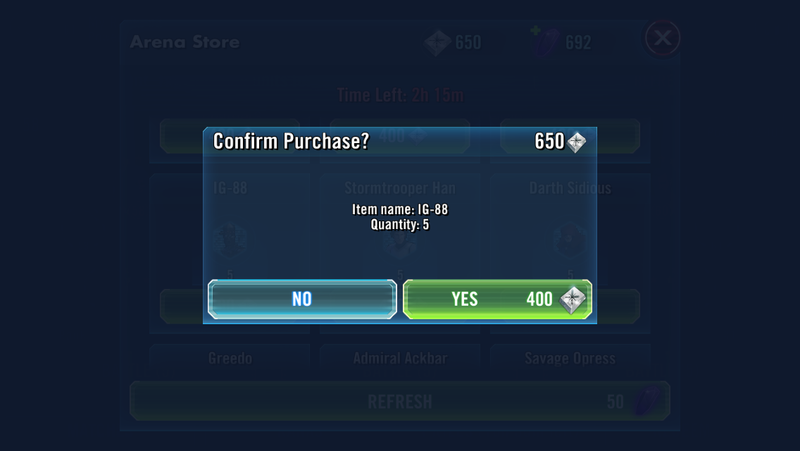 If a free to play player were to buy a single item I would recommend that one. All the characters inside that pack is farmable and it's so easy to climb ranks with just them. Even with the speed meta one can still be competitive as the damage those droids dish out is insane! Sometimes I'm surprised myself seeing huge crits and one shots from my team. Staying at the top ranks reduces your crystal refreshes as the number of ranks that are below or above than can attack u is greatly reduced. Well done to keep yourself up there! It's a very big accomplishment as a completely free to play to be among the P2P and still hold strongly in place. 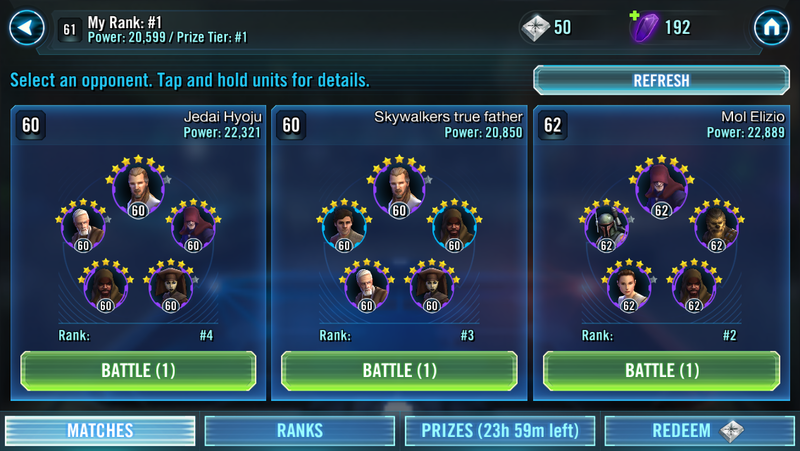 With synergy a first order team would be pretty strong. 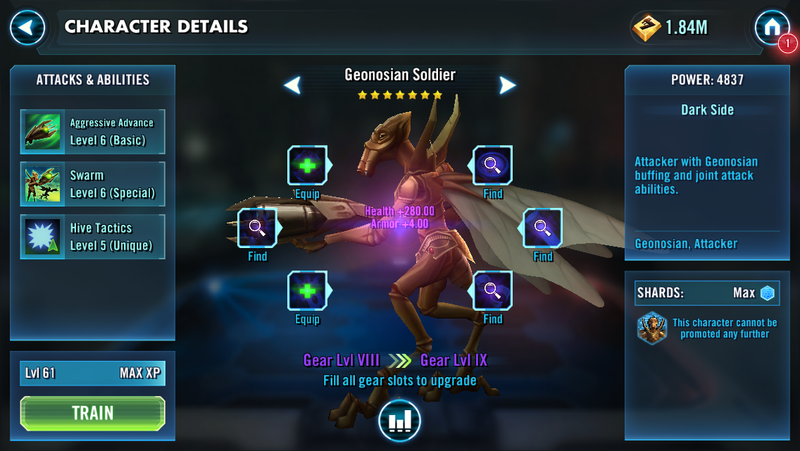 GS is one of the easiest toon to farm and I very highly recommend it. Still viable for end game and at level 80 the assist is every turn. One of the best damage dealer out there and can fit any team. 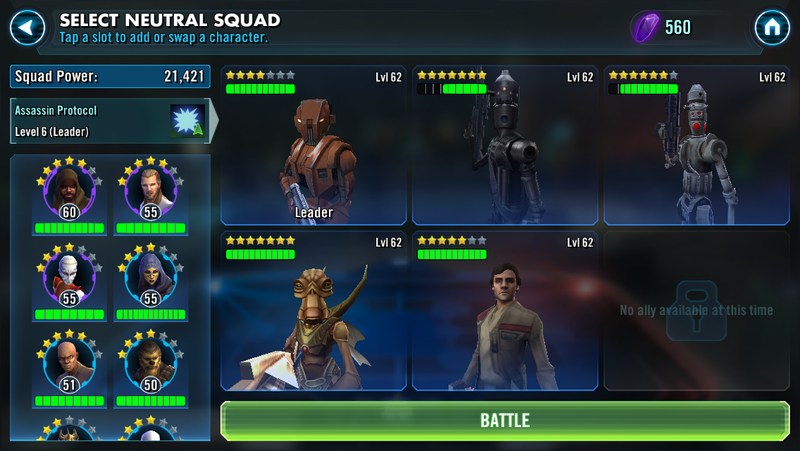 Poe deserves a place in anyone's squad. There is no other tank that can taunt for 2 turns and keep your squishy dps safe. At 5* and gear 8 he's a force to be reckoned with. QGJ is in his own league. 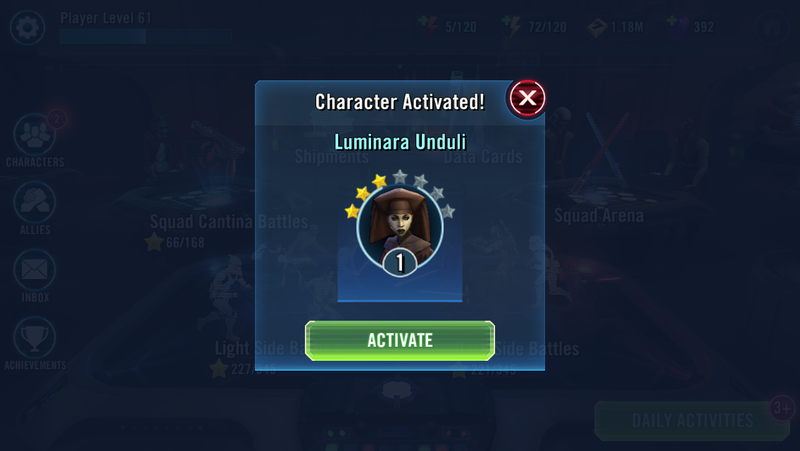 Worth every ability mats, upgrades, and credits. Thank you bro. I have been pretty hesitant on who to upgrade next. 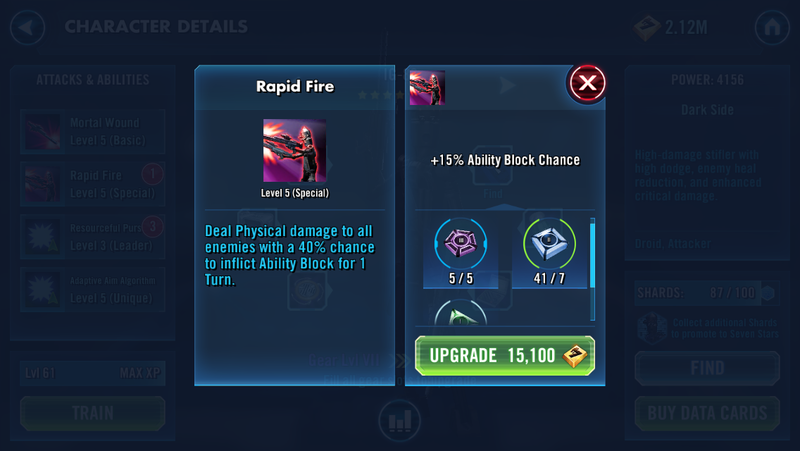 It is so slow on ability mats. I watch YouTube videos where people will have 400-500 blue and green mats. How TF do they get all of those? I need some purple mats like crazy. 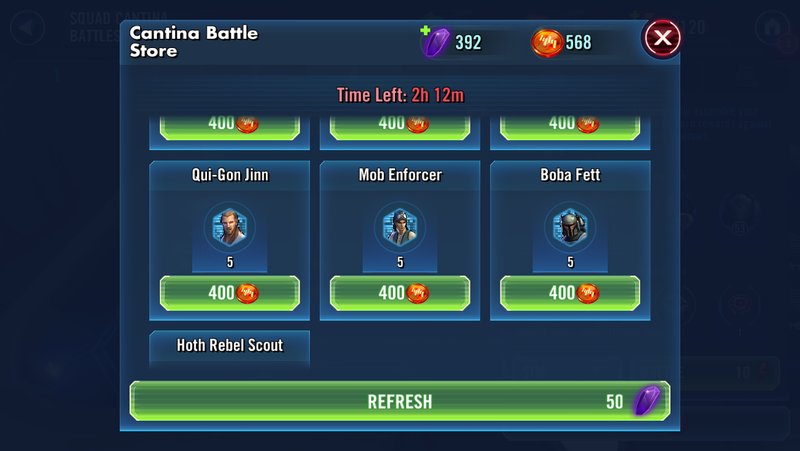 I can do Cantina all day and usually get 0-1 purple mat. 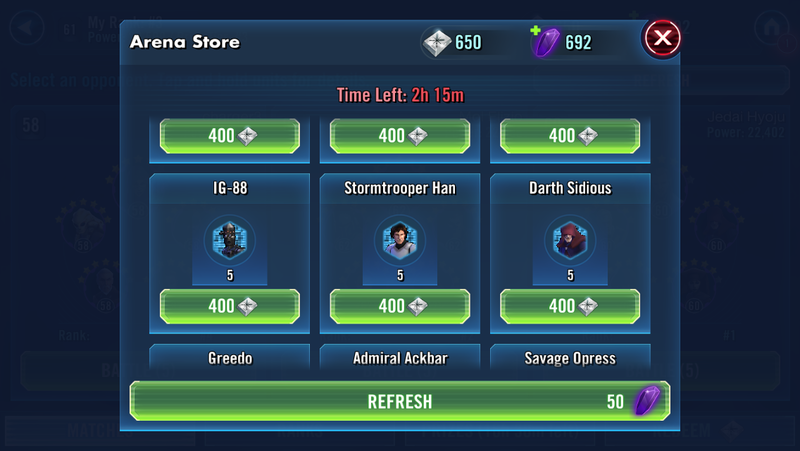 I wish buying ability mats is an option.....if that was the case, I could really get Kylo, QGJ, and GS up to par. Right now my GS is 3,3,3 abilities. Kylo is at 5,4,3,3. QGJ is 4,5,3,3. Really need some purple mats. I can't get them from Galaxy wars because I can't beat it. 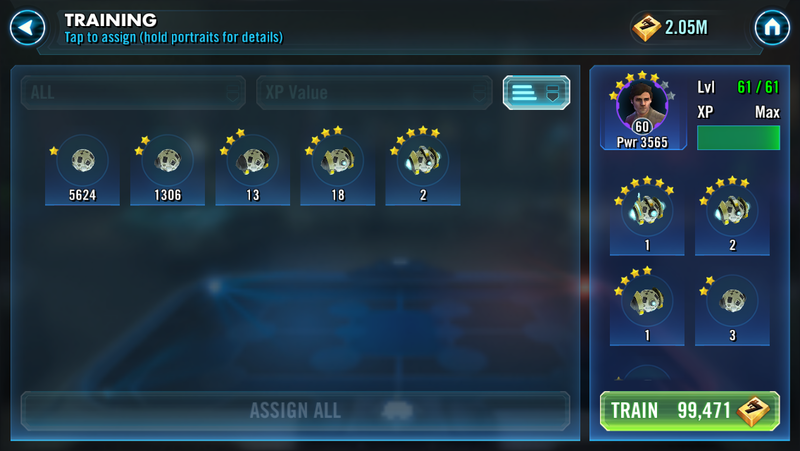 Even with all my character, Galaxy wars seems impossible for me to beat. I am facing 7 star, lvl 70 teams from battle one forward. It's rediculous. @reyia. 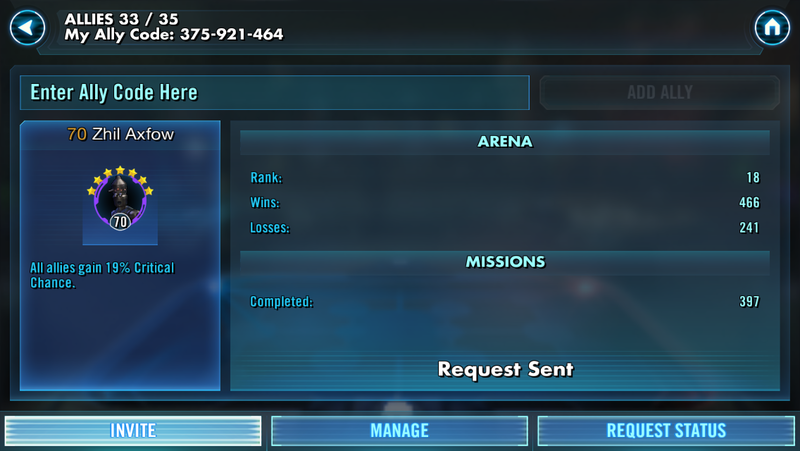 I finished 2nd in Squad arena today. You were in first position, but I didn't attack you. Instead I killed sky walkers father. He has an easy comp to beat. The blue and green mats are very easy to get and u will easily get excess of them at a later stage. The only hard to get ones are the purple ones. They very rarely drop. The ability challenges give them and most of them will come from cantina. 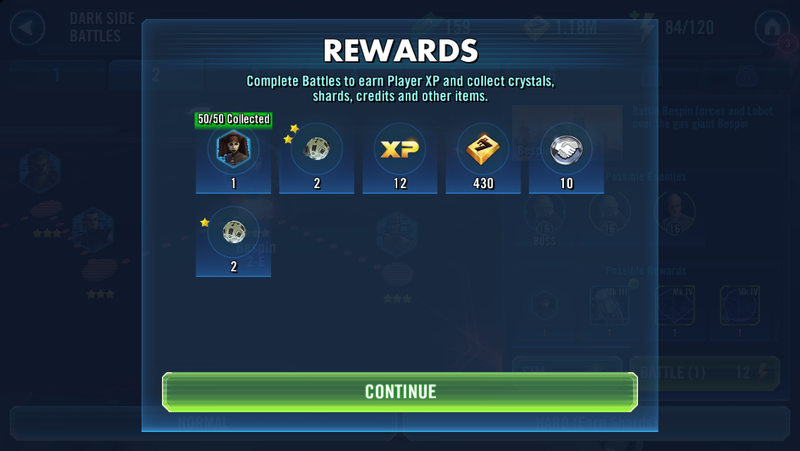 Just do two cantina refreshes daily and hopefully a few drops. Having such a large roster like u do, u will have to make a choice. A select few needs to be chosen and they will be upgraded first. Don't upgrade everyone at once. I did keep rank 1 for a long time lol. Noone is attacking me. Or maybe many attacked and failed haha. It's okay u can take rank 1. I need it only at 6 pm Australian time. At that time I will snipe and keep attacking till I get it. Yea Skywalkers father is a weak team. I enjoy killing his team and BarryDaTroll. Same I'm jelly too. 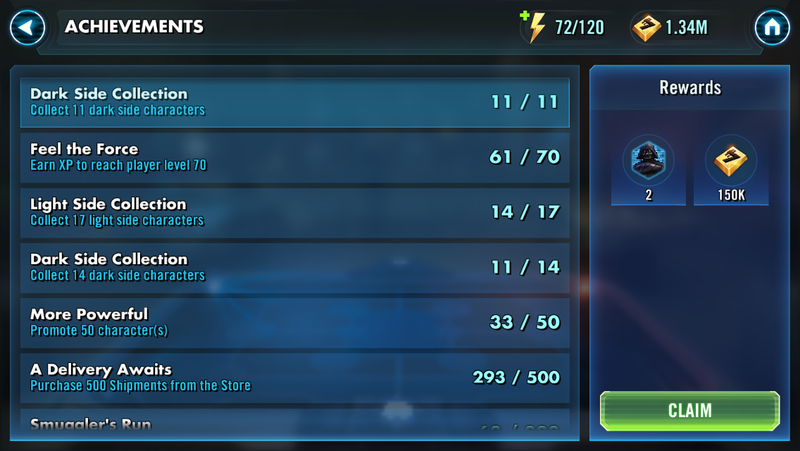 I'll never have that many toons unlocked and at high stars. Especially all those chromium only ones. Dear Diary, today has all been about Poe and GS! 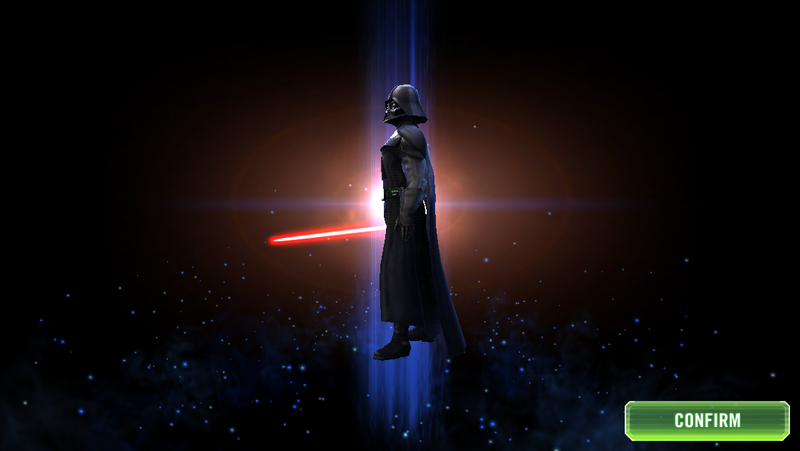 Level 61 was a big stepping stone as it enabled Poe to equip the last piece of equipment in order to upgrade to gear level VIII. That meant Poe gained speed to his maximum of 142 (143 before latest patch which nerfed him). With the speed increase he could go first and taunt for two turns protecting the often fragile team members. 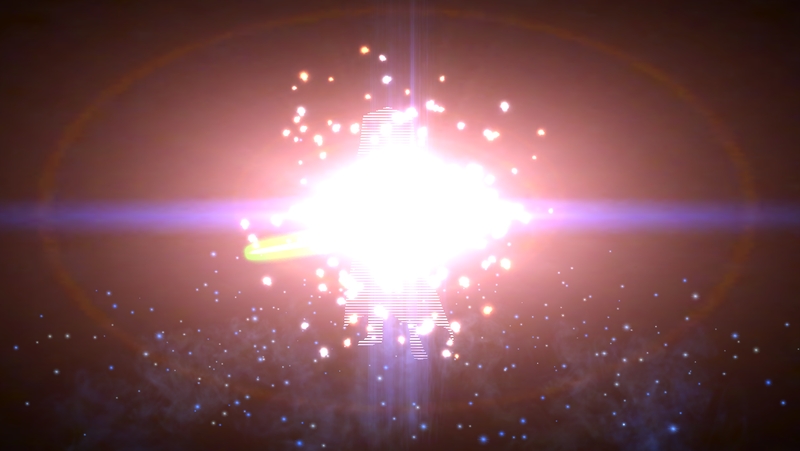 That little bug GS got a significant damage boost to his bfg and now can one shot many characters with his assist. 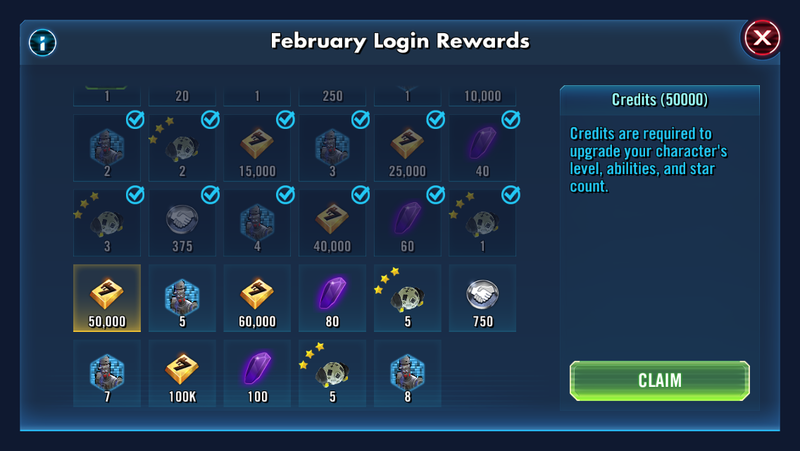 Today's login rewards is 50k credits. 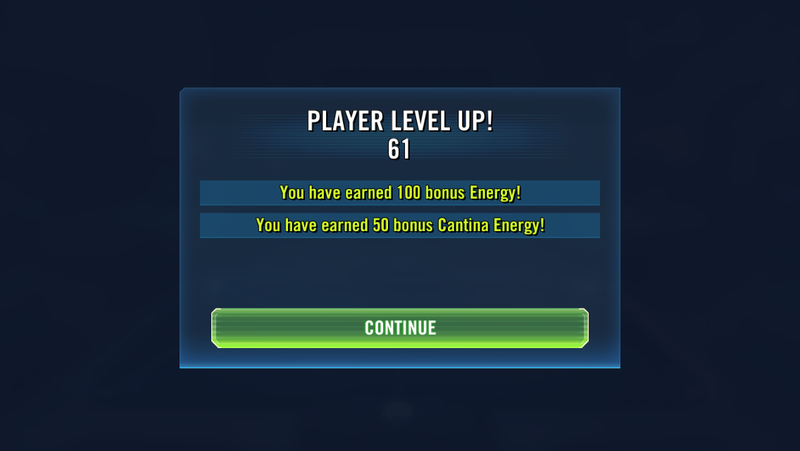 Huge milestone at level 61. 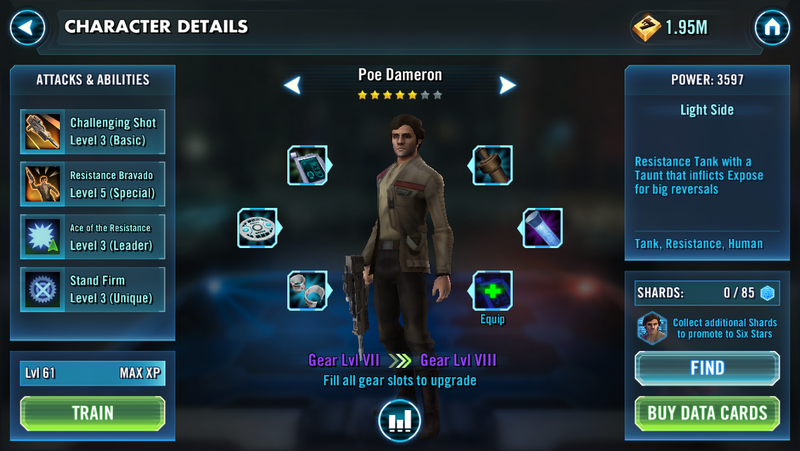 Yellow cross meant gear was available but hero was too low level to equip it. Thanks to @Qeltar who pointed out to use the bigger training droids first before using the smaller ones. The one and Ponly Poe Dameron! What an ace. Not only he stood firm but he's also firm in other aspects. 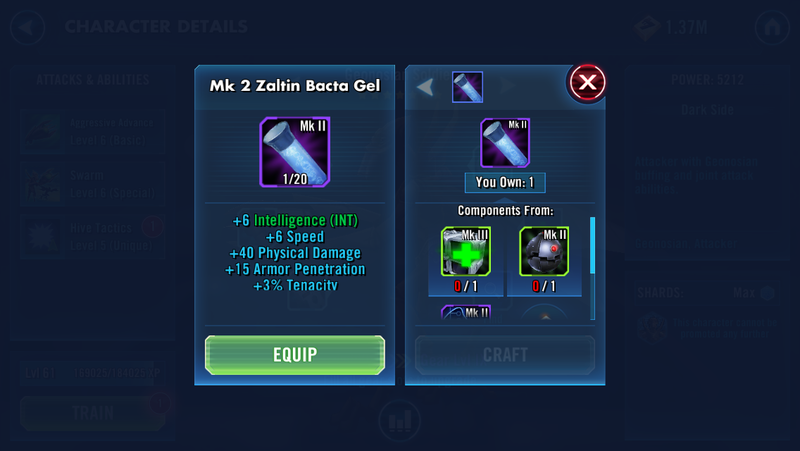 So many refreshes were used to farm this. Ready to become a brave Ace. Those who mocked me. If only u could see me now. 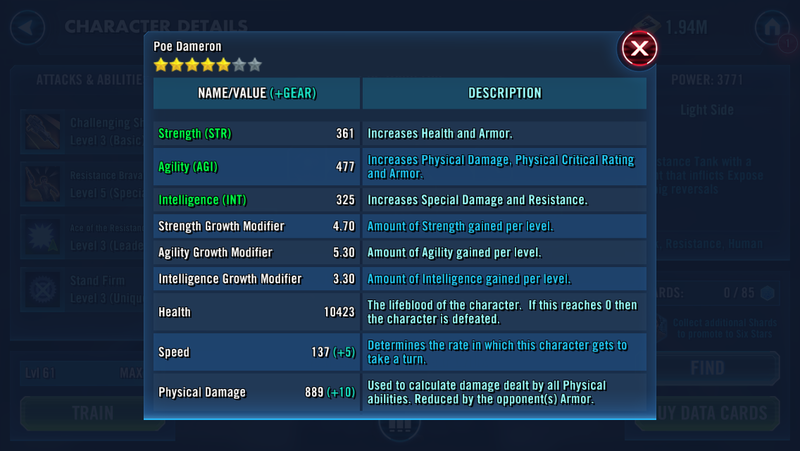 Farmed upper left Poe's gear. 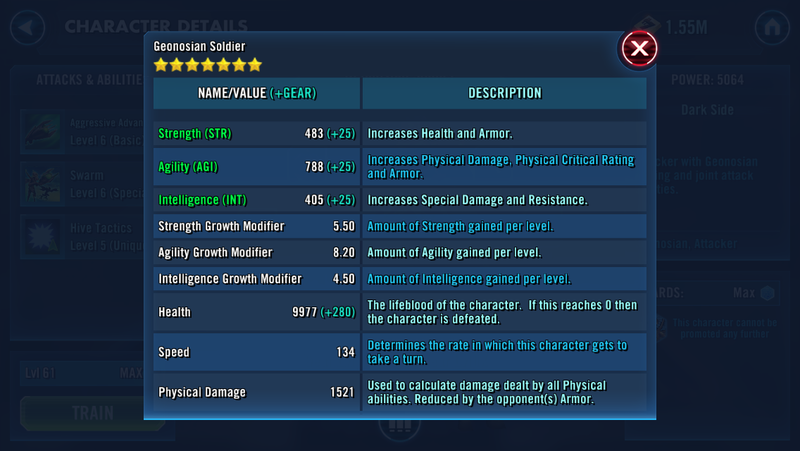 Poe's complete stats. Most important one is speed. The bug with a big alien gun. One un equip-able gear. Nothing a few credits and droids wouldn't fix. 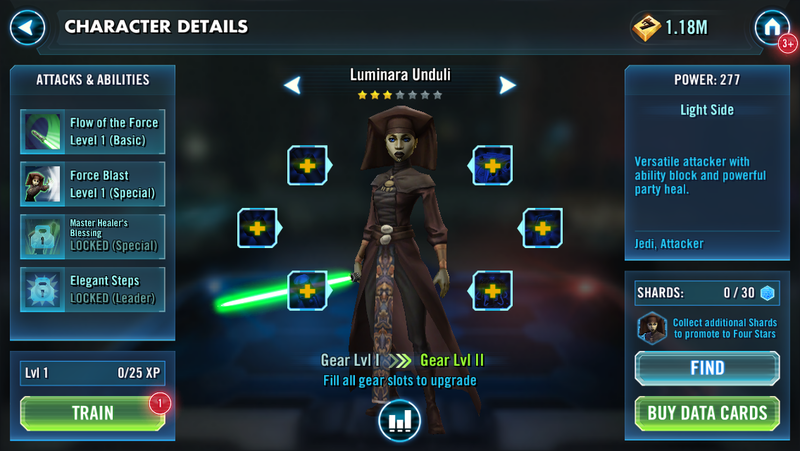 Gear changed colour from orange to green. Anyone want a piece of me? I'll aggressively do some armor penetration with my gun. 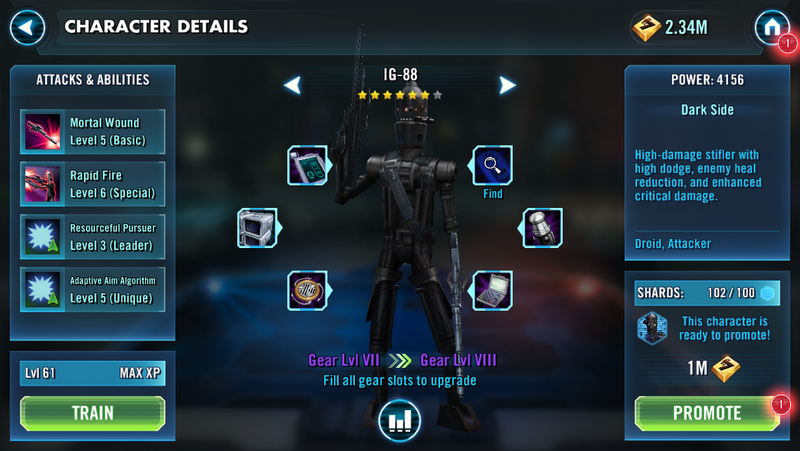 Gear VIII GS. Advancing rapidly. Complete GS stats with gear upgrade. 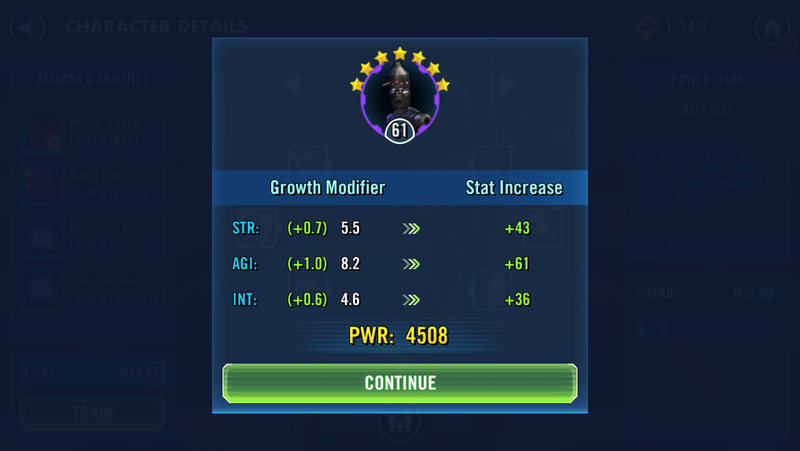 Had a few rare purple ability mats and I chose to upgrade IG88. 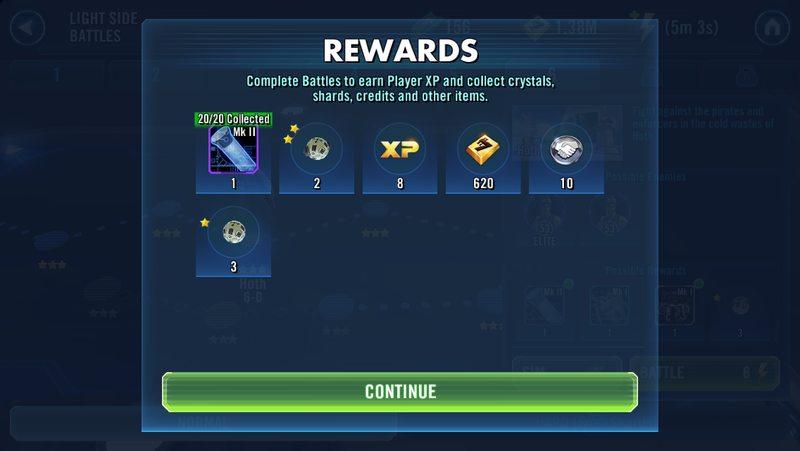 @Jabba asked me if I wanted to use his poggle. Sure why not so I added the former. 1m25s before prize time, will anyone snipe me? No? Okay then snipe me in 23h59m. Free energy came at the exact same time as prize. 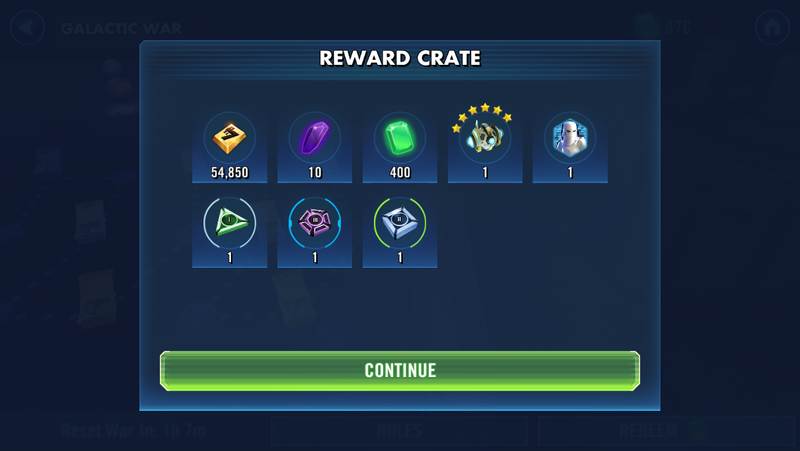 Gees thanks for the rewards. Here is my complete roster of characters. @Annastrasza asked What type of player are you? I replied Chirpy Dolphin with the following post. I'm a dolphin swimming in the endless water with the wind carrying the salty sea scents. I watch birds flying in the crystal clear light blue sky, feel the gentle never ending waves on the skin, and lose myself to everything but that moment. Yea Bryan is absolutely loaded with right cast of characters surprises me gw so hard for him I see full level 70s around 5th battle I been running Qui gon yoda lumi jc and Barris lately for fun get gw done in 30 mins retreat some and have to sub geo Poggle in at times but 3 healers work well I watched video on that from team instinct and ever since no problem gw started from soft launch what maybe 3 months playing have lil over 50 completed but before video gw was difficult 2 fast dps 3 healers been able to start next battles with abilities reset as well the video will show better than me explaining lol I thought my roster was good Bryan kills it hehe I figured out screenshot just need the app loaded share I'm on it will soon. It's really easy to share images once you've done it once. To make it easier download the Imgur app, then just upload your pics. They will have links to the images then you can post them in the forum. Videos can also be shared easily for eg this droid synergy video. @reyia I hit you twice tonight and couldn't beat you either time. 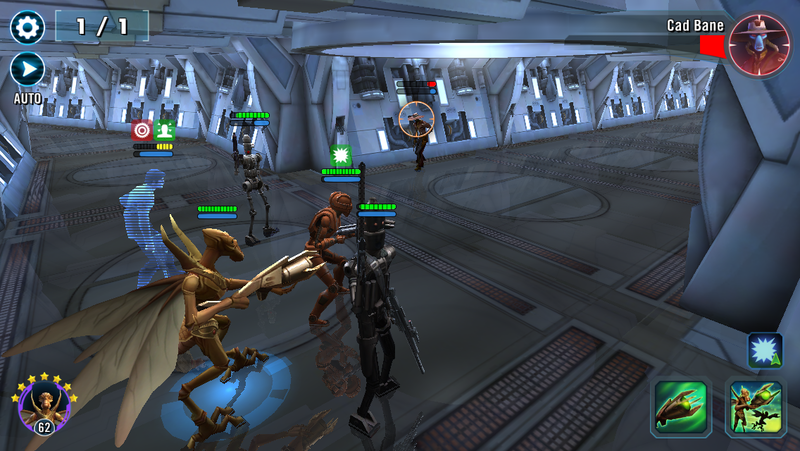 Your Poe wins the battle for you as he tanks so fast for your hard hitting droids. Crazy!! 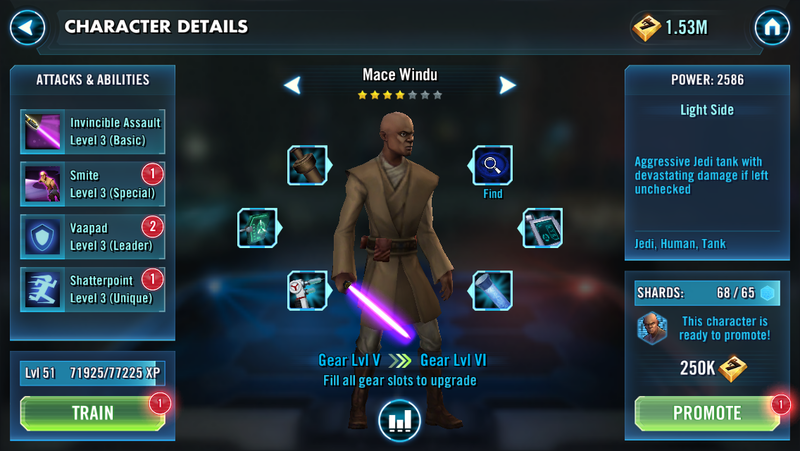 Another thing to look forward to in the future....when QGJ ability level is maxed, he can give 24 speed to all allies.....not just Jedi allies. That is gonna be a huge advantage.....regardless which team you have. Looking forward to seeing how all that goes. GL everyone. Bedtime for me. Serious?! Why can't you? 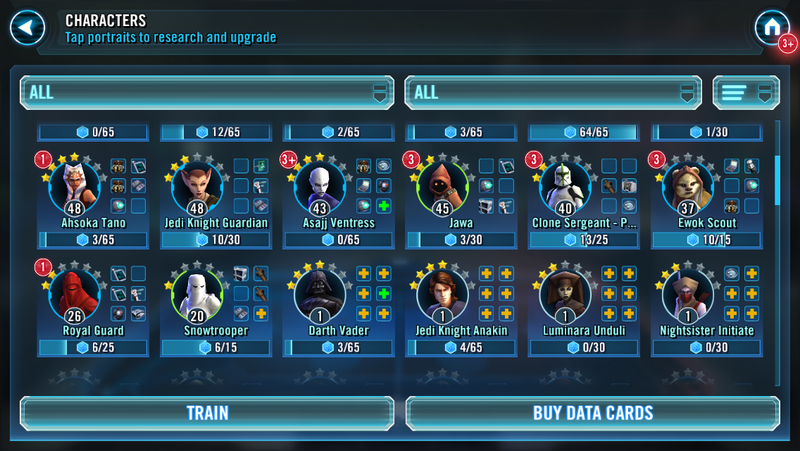 You have ALL characters unlocked, so you can make any team synergy you like! How fast is Poe compared to your dps? There are quite many heroes out there that can move faster. It used to be a dice roll who moved first but now it's strictly according to the speed stat. 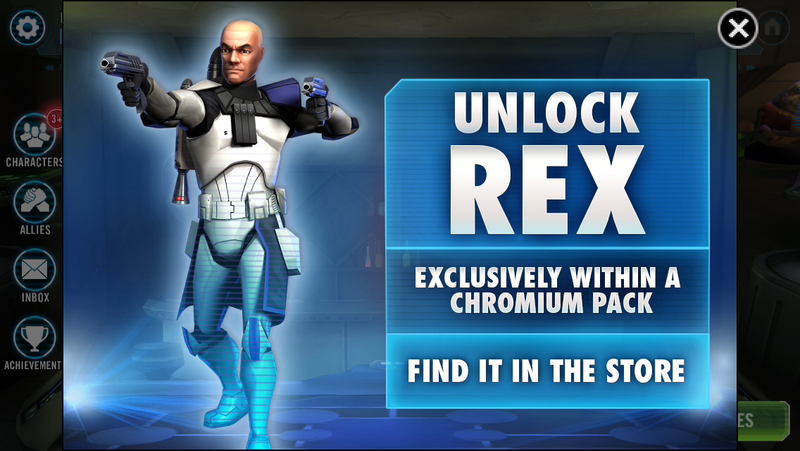 Rex need clones to work and ATM there aren't too many and they are not that strong. CT5555 is pretty good though with a huge health pool and counters. Same, I'm looking forward to his speed ability that makes everyone faster. That's a massive advantage, everyone will be running QGJ!! 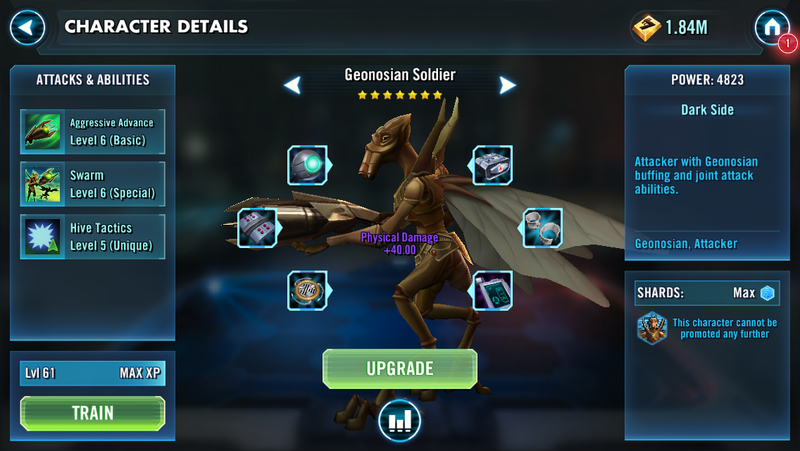 So better get him to 7* and max gear now! Good night! I don't know what's that but it didn't work in my end. Imgur app is one of the easiest app for image sharing. If it's a credit card it will take a few days for the refund to be processed. I buy iTunes cards to recharge my account when I need to buy vaults of crystals. They are cheaper that way and less of a hassle. We get iTunes sales all the time in Australia through various retailers such as Officeworks, Coles, Woolworths, Target, and other department stores. 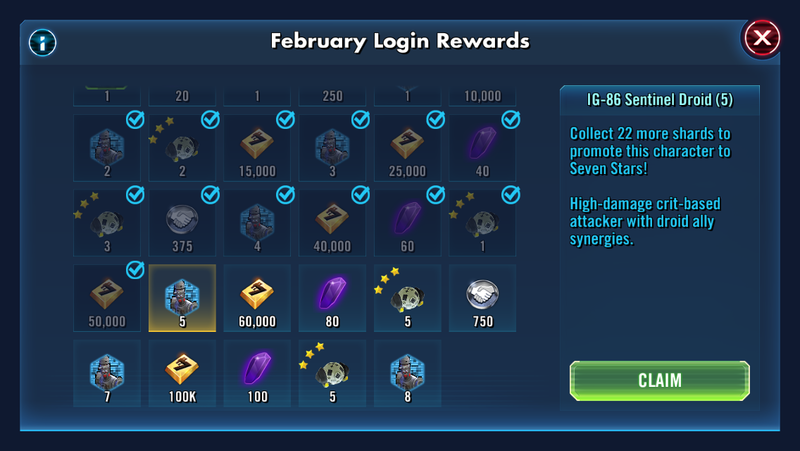 Dear Diary, today has been a massive day of promoting existing heroes and activating new characters. 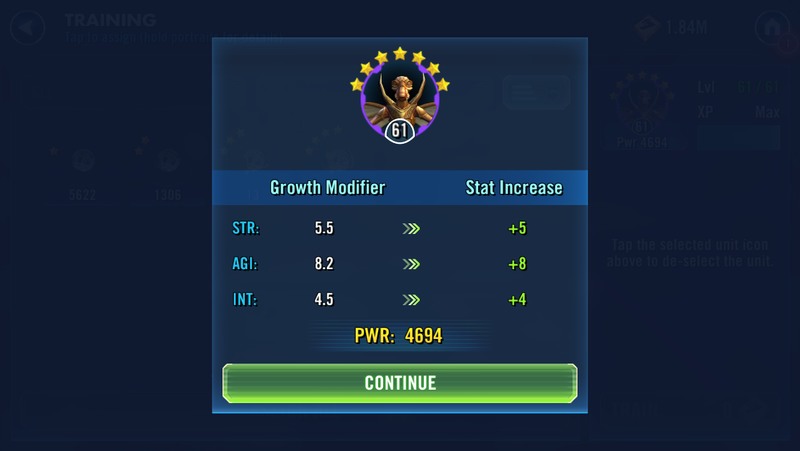 Three weeks of buying IG88 shards from GW paid off and I now had a 7* one!! Cantina shipments were used to buy QGJ shards and he was promoted to 5*. 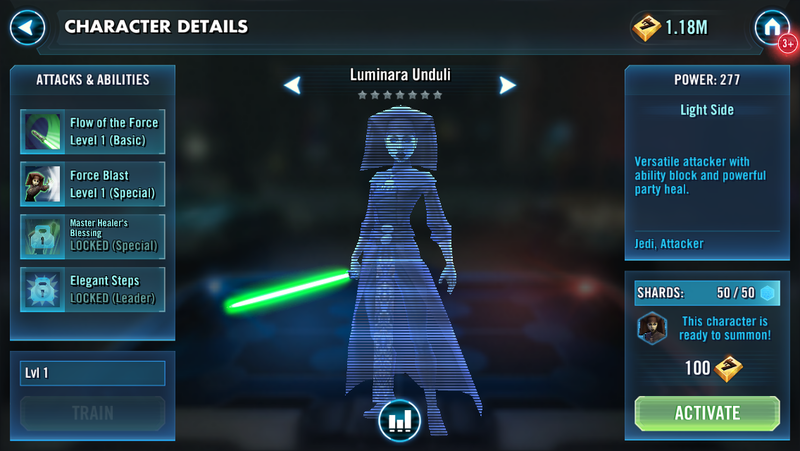 All those days of doing hard nodes paid off and I had enough to unlock Luminara. She was classified as an attacker but her healing abilities were phenomenal. An AoE heal plus an additional heal at the start of two turns, wow! AoE meant Area of Effect in case newbies who just started didn't know the meaning. 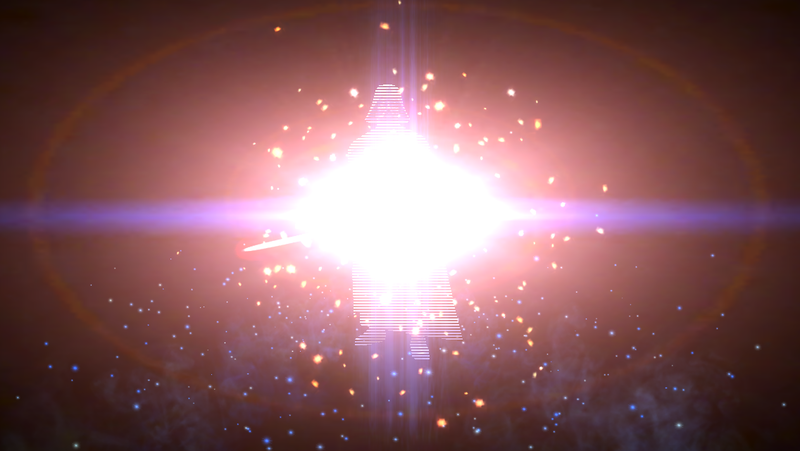 AoE is a term used in this game to describe attacks or other effects that affect multiple targets at once. 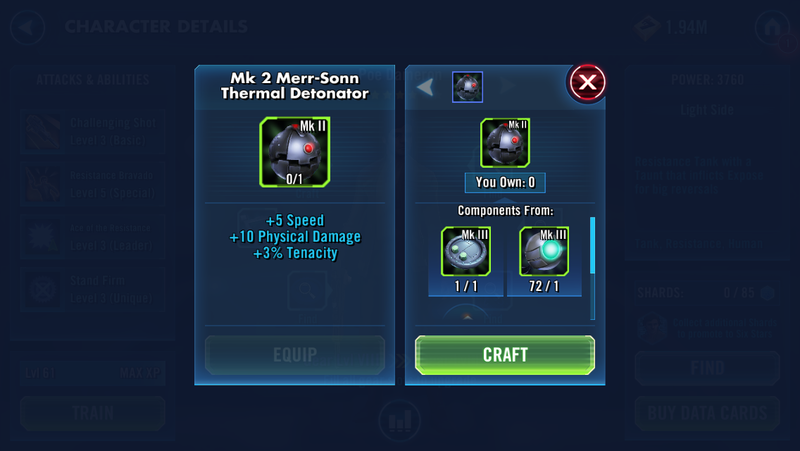 97/100 shards of IG88. Hardware upgrade imminent. 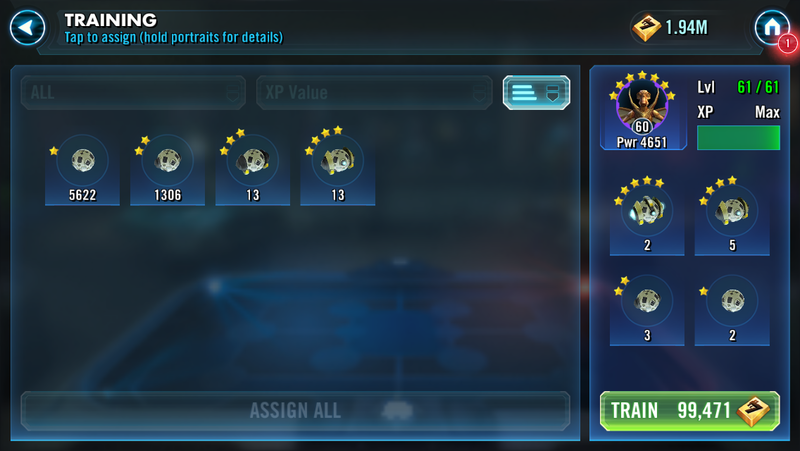 I had 650 arena tokens. Would u like IG88 shards? Yes please! 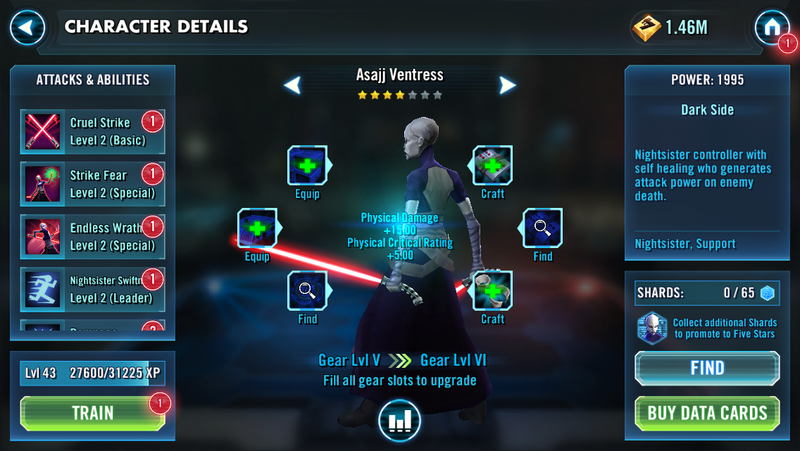 Shards download complete. Check-sum verified. Initializing hardware upgrade. Upgrade complete. Single beep. Power On Self Test successful. 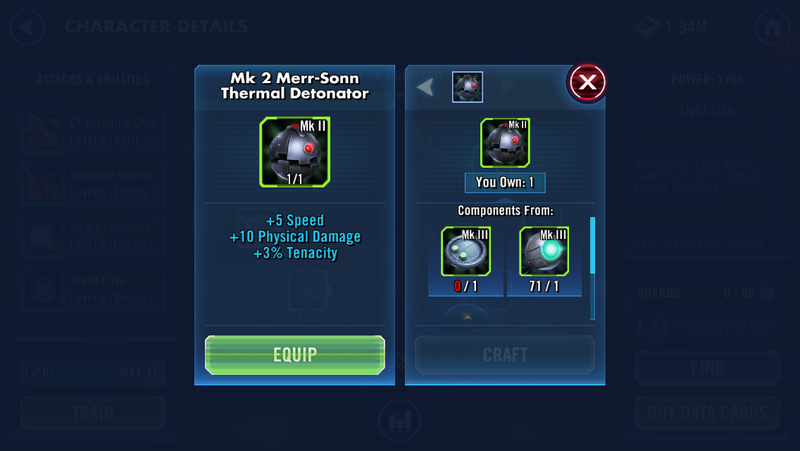 QGJ the meta definer was available for purchase in cantina. Who can say no to the one who wields a massive weapon? The Force was growing stronger in him. 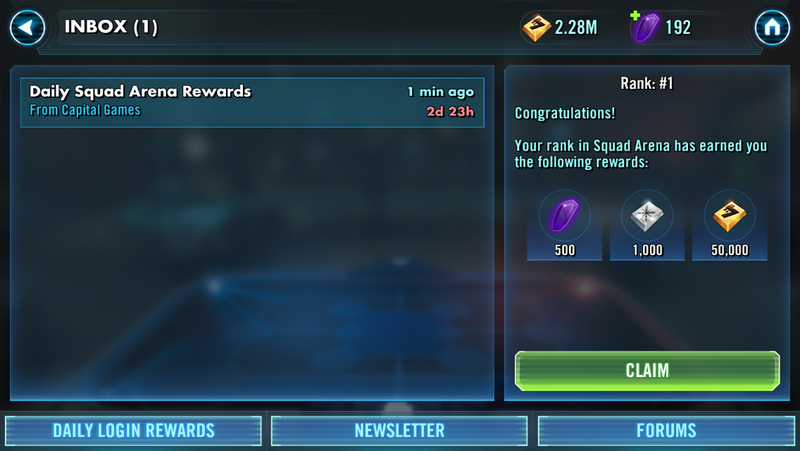 After patiently farming hard nodes in LS 3-D and DS 2-E I obtained 50 shards! Let the Flow of Force begin. Achievement unlocked- Light Side Collection. 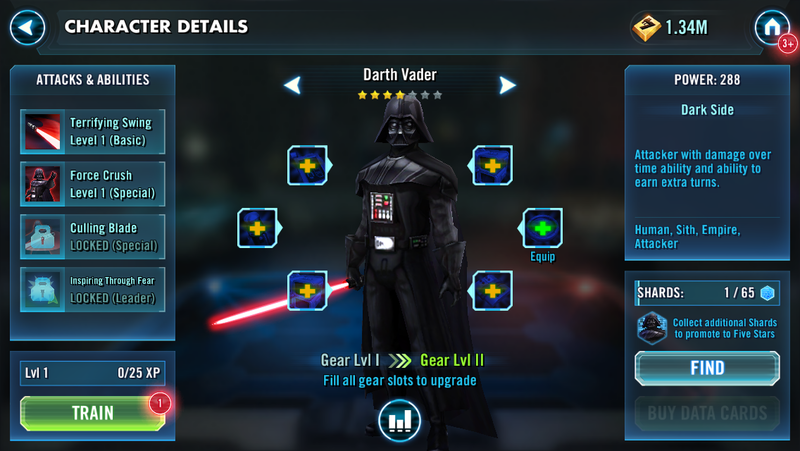 With the two shards obtained in the above achievement I had enough to unlock the master of the dark side, none other than Vader himself!! Today will be a day long remembered. It has seen the death of Kenobi, and soon the fall of the rebellion. 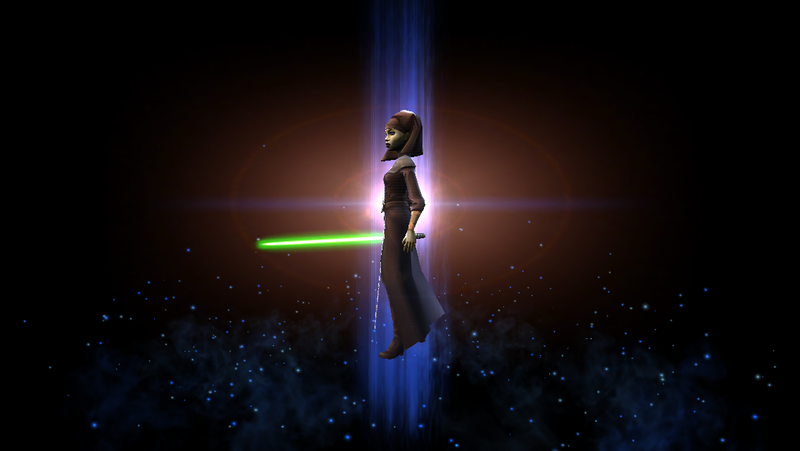 Achievement unlocked- Dark Side Collection. 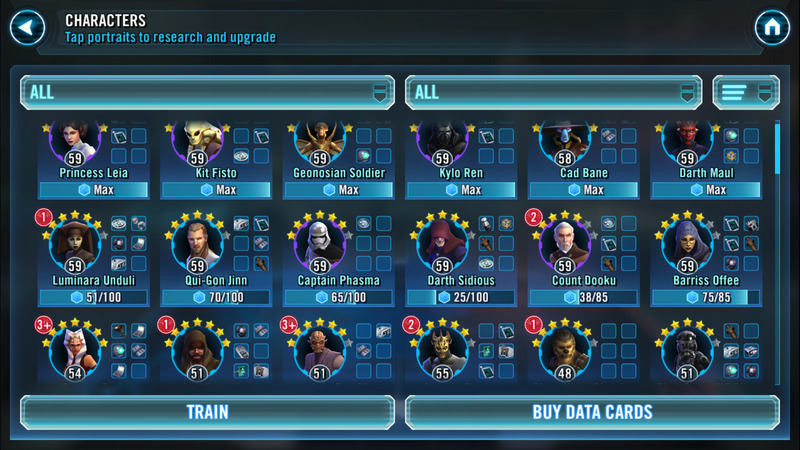 My new toons looked so cute together. All level one babies. 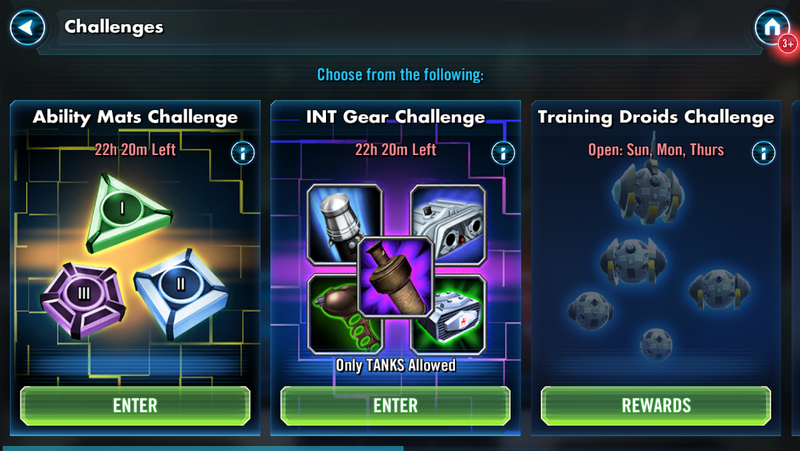 Today's challenges were ability mats and INT gear. I had 4 purple mats and had 5 choices in upgrades. 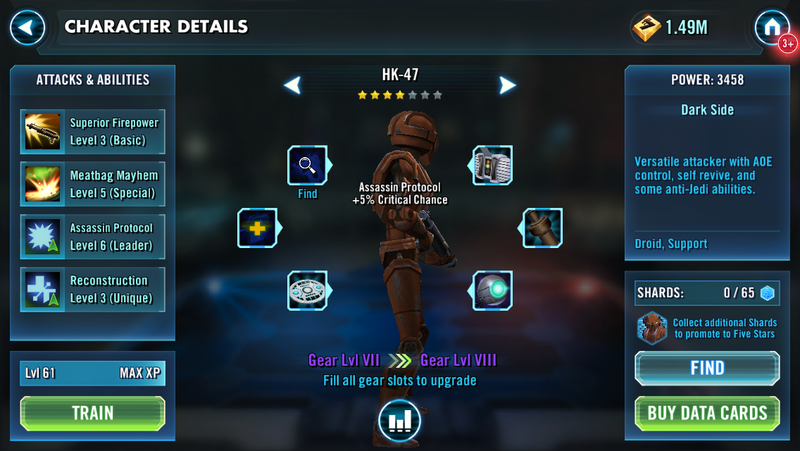 I chose to upgrade HK47 as 5% extra crit chance was invaluable especially in a droid team. 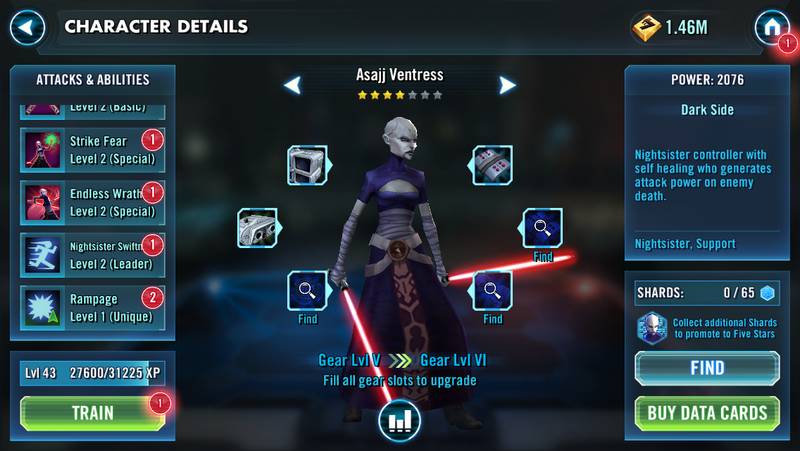 I decided to work on Ventress as @cosmicturtle333 loves his nightsisters' team and said lots of good things about them. 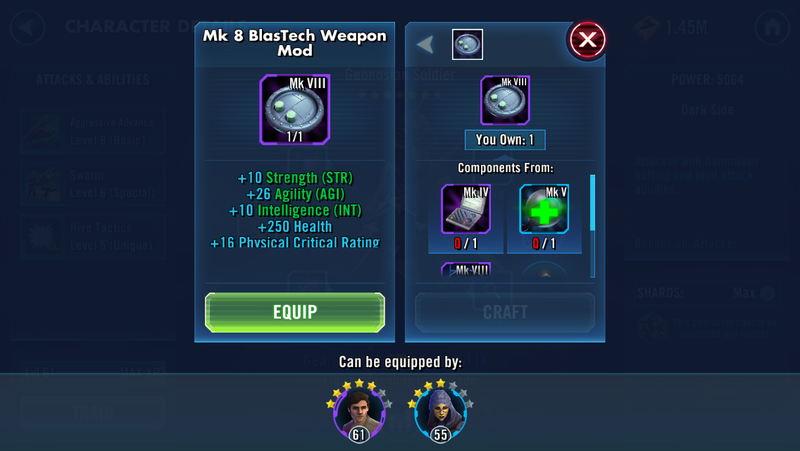 I farmed some gear for my GS. Strong enough to do the Mace dance. I gain a level to 62. Was I advancing too rapidly? 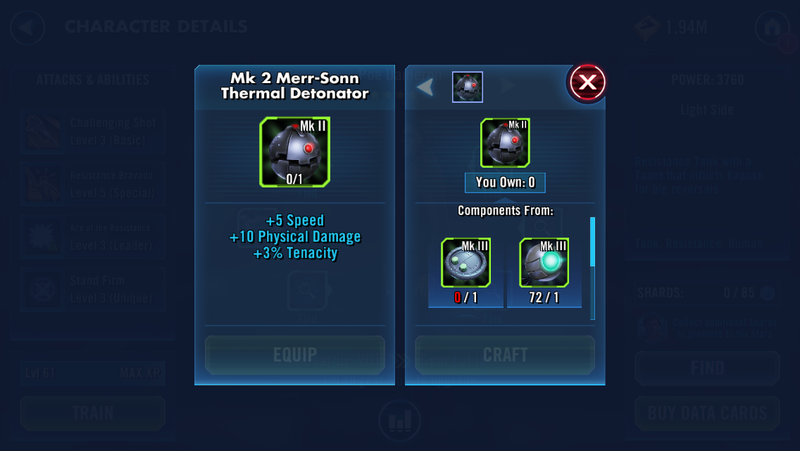 Farmed another gear for GS. 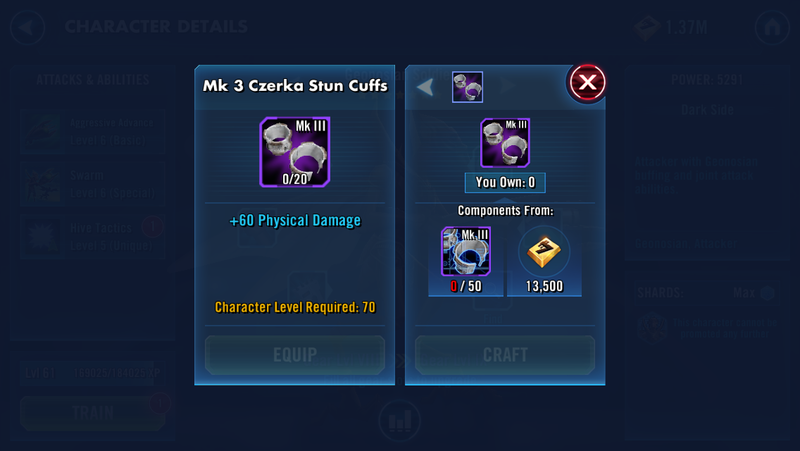 OMG 50 cuffs!!! It's gonna be hard to get that many! MK8 Holo Lens located. Hostile resistance not expected. Extraction approved. 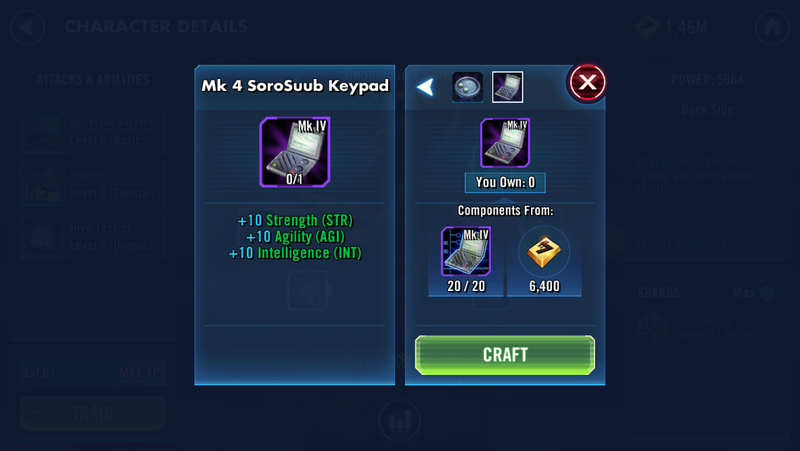 Completing ability mats challenges awarded a few purple mats. 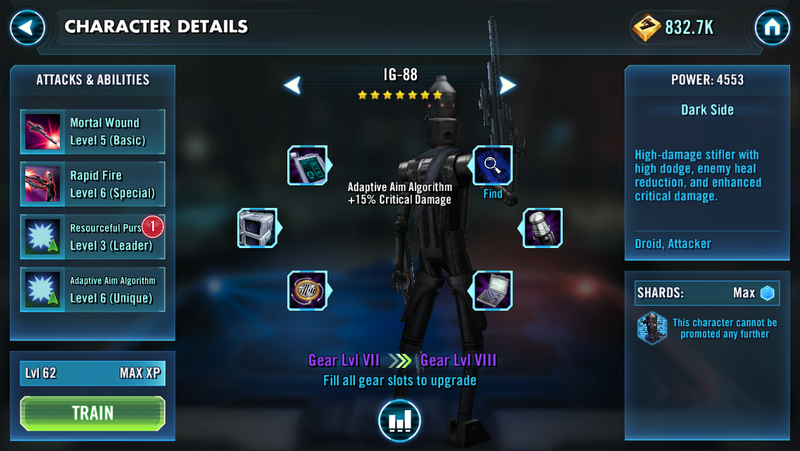 Upgraded IG88's ability. Adaptive Aim Algorithm's software updated to 6.0. The last node of my GW was easy. I used my arena squad for that. 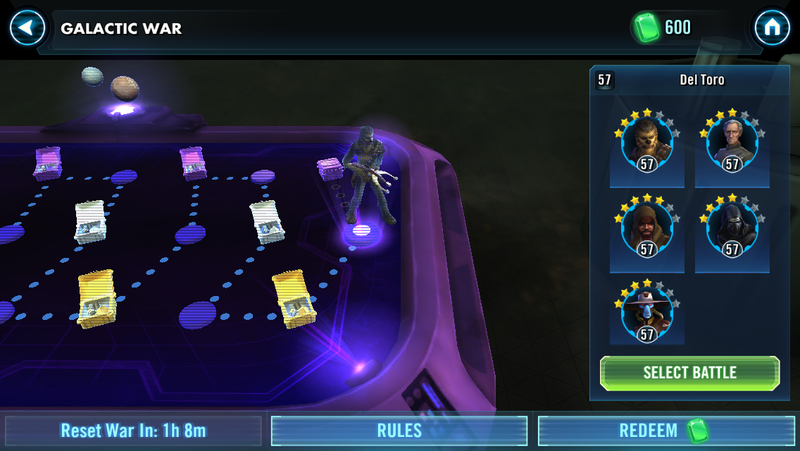 Cad Bane left standing alone and my team was intact. The meta has changed so much since the patch update. It used to be get Poe or get Poewned. People complain all day long about characters being OP and the result are nerfs. Poe got so many nerfs it's unreal. Was that enough? Nope. Game update did stealth ninja 'adjustments' and were later published. Poe nerfs at level 70 at max gear. 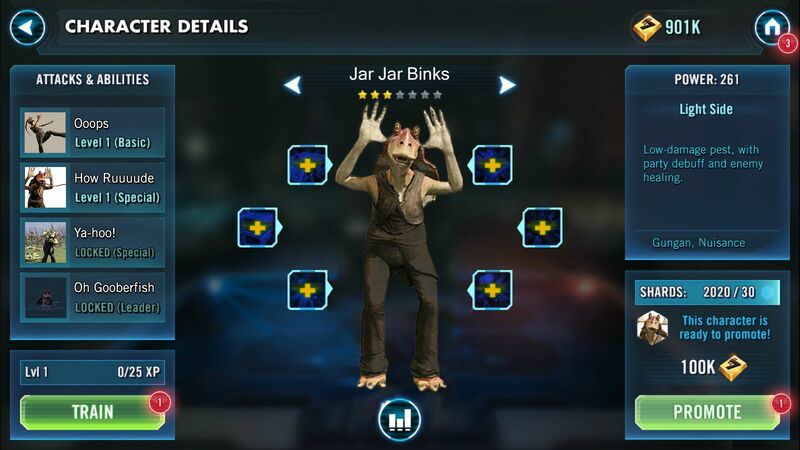 Will Jar Jar ever be released in SWGOH? Well I hope so! Indeed now it seems everyone should have QGJ. He's too great of a hero to be missed. I used to run a Phasma team since I first started playing but not anymore. Poe was a once of its kind phenomena. He made a meta just by being there. I liked playing Galaxy of Poe more than Galaxy of Nerfs. 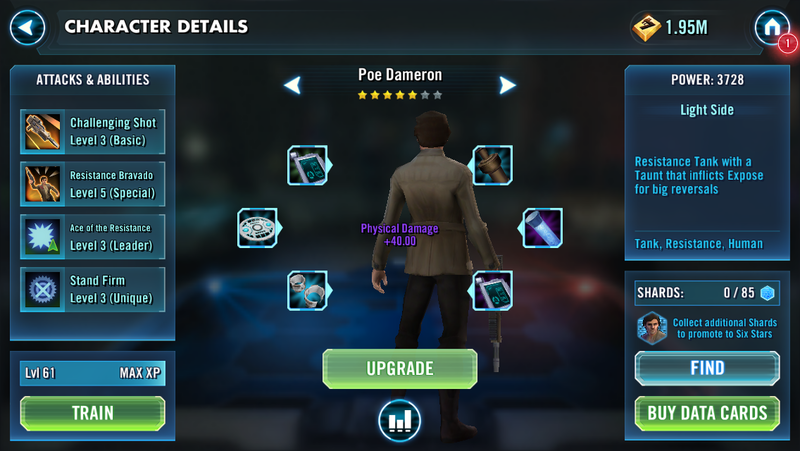 In what ways are you using Phasma now? 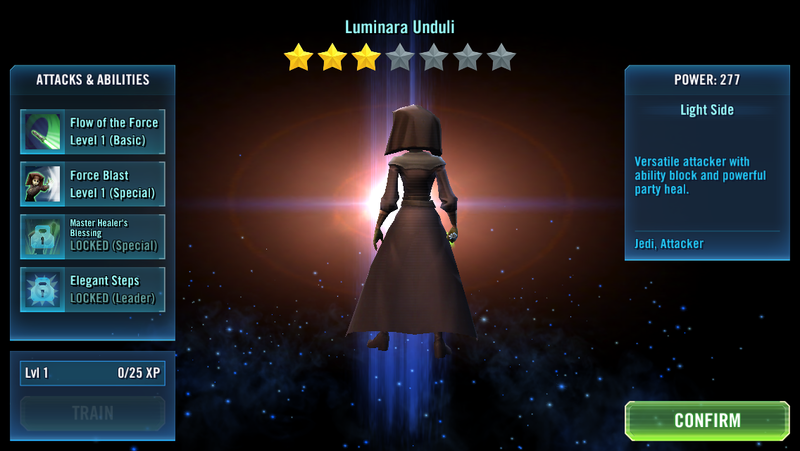 The former was my first 7* ever in my main account and I used her almost everywhere. Now it seems the speed and damage meta is on, so I'm focusing on getting fast dps heroes stared up. I used to be able to have at least 1-3 exposed on Poe's first move. Now I see none regularly. The turn meter down was final and unresist-able. Nowadays it can be resisted. 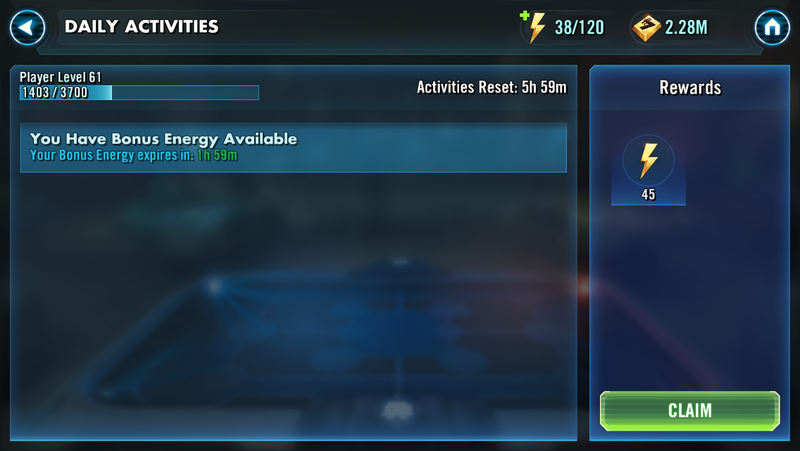 That update took away the major abilities of Poe. 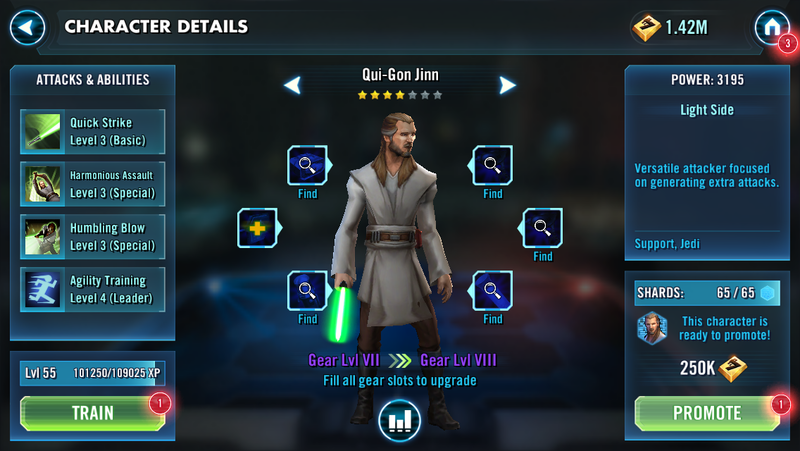 QGJ will be nerfed in one way or the other considering the number of increasing posts about him. It's like a cycle certain heroes get used a lot, people complain, and they get nerfed. Me too. Bring back the dice roll to see whose Poe started first. 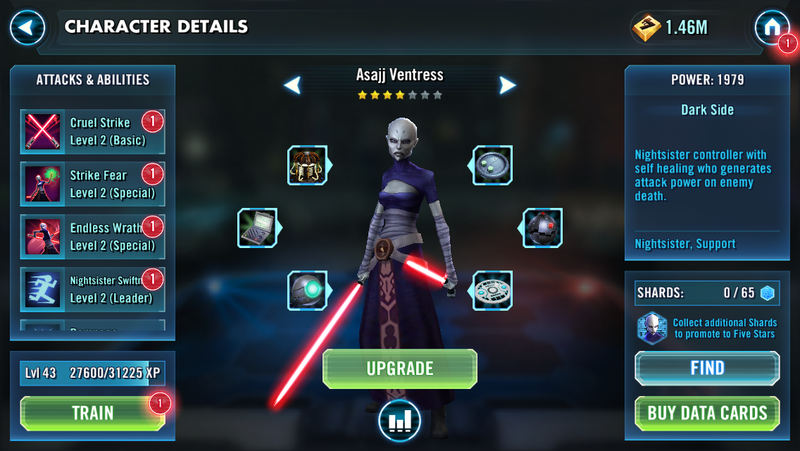 Now it's more like do something about Dooku already, Dooku is OP nerf him, and lies about Savage Opress being meta. Hey @Gonakin ! Glad to meet another server mate! We haven't fought each other before as the gap who you can fight diminishes greatly the higher you go. 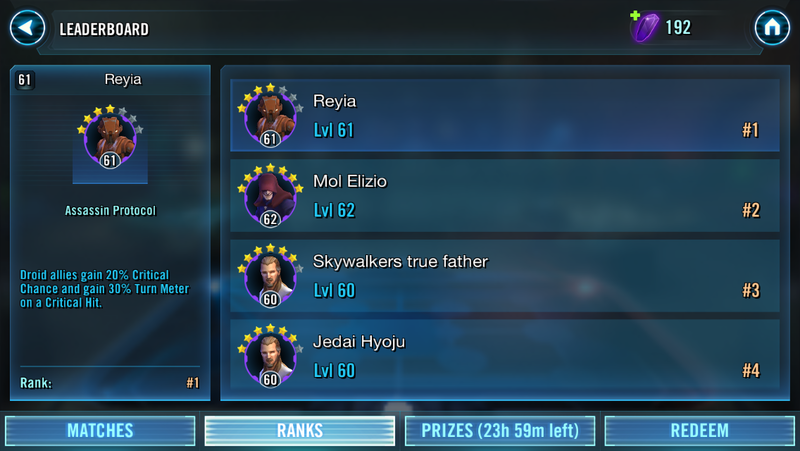 I had a look at the ladder and I see you at rank 60 now with a 3* QGJ leader. Good luck to you too! Sure, can't wait for you to take rank 1!! I'll be right here waiting for you.